Candy House Escape info about the game-Games2Rule. It is a fantasy world!! Your appetite for candy gets fulfilled in candy house and its time to get back to your home. 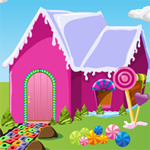 Escape from the candy house by using objects found the candy house.